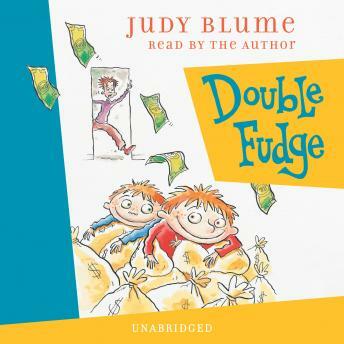 Listen to "Double Fudge" on your iOS and Android device. Fudge is back and he's discovered money in a big way. He's making his own "Fudge Bucks," dressing as a miser for Halloween and thumbing through catalogs before bed, choosing birthday and Christmas presents years in advance - much to the embarrassment of his family, especially older brother Peter, who's just starting 7th grade. But things begin to change when the Hatchers discover their long-lost relatives, The Howie Hatchers of Honolulu, Hawaii - not exactly your everyday family. With new cousins, Flora and Fauna, and 4 year old Farley Drexel - yes, that's right, another Farley Drexel! - the stage is set for a wild and wacky beginning to a new school year.